File under "It was only a matter of time": The Las Vegas Review-Journal reports that Nevada gaming authorities are warning casinos to be on the lookout for blackjack card counters getting an assist from their iPhones. 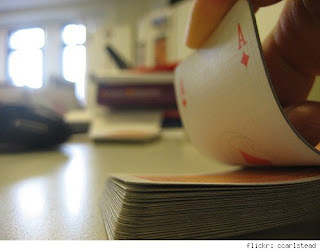 While card counting itself is not banned in Nevada, the use of an assistive technology is a felony (! ), and apps like Card Counter or A Blackjack Card Counter make it much easier for the math-impaired. ABCC's 'stealth mode,' which uses vibration to alert the user when the time is right for a big bet, is particularly head-achey for casino security. Nevada casinos don't have any instances yet of gamblers being kicked out or arrested for iPhone use -- the initial warning was from California authorities, who spotted card-counter apps in use at a Northern California casino and thought it prudent to raise the alarm. The lure of easier blackjack winnings may be too tempting for some people to pass up, but the consequence of this iCheating may be that we all have to check our iPhones before heading to the blackjack tables. Aside from the logistical challenges of an iPhone ban in casinos ("Sure, I don't need my phone, my family knows that I'll be here at the quarter slots for the next five hours"), this is a fascinating example of how the App Store is turning us all into denizens of the Matrix, with skills and information on demand and jacked in, literally at our fingertips. Need to level a bookshelf? Fine. Want to identify local birds? Done. Get your garage mojo in gear? Can do. Learn a language? Of course. Adding the ability to move money from the casino's pocket into yours with better odds than usual seems like a natural next step... and another 'disruptive technology' is going to come into conflict with a long-established, politically and economically powerful industry. Let's watch. Update: Commenter 'brainopera' contributed his "Matrix moment" -- have you had yours yet?